There is nothing quite like the rush of being on the field, court, or in the gym. The enjoyment that you gain from a good workout, fast-paced environment, and friendly competition is hard to pass up. When it comes to working out, 55 million Americans own a gym membership that gives them access to a workout area, pool, and track. Being active is not only proven to improve physical health but mental health as well - it can even help you live longer! Exercise is definitely worth the aches and pains from time to time, but the more you do, the more those aches and pains can start to mount into something more. That’s why we’ve put together this list of five common injuries while exercising, and how a TENS unit can help relieve some of the pain. Strained Shoulder - One joint that has a large range of motion, allowing injuries that include poor posture and technique, is the shoulder joint. A shoulder strain occurs from overstretching or tearing of a muscle or tendon in the shoulder. When it comes to the shoulder, you do not want to continually push through the pain, as these injuries can be excruciating, limiting, and slow to heal. Rest and strengthening will be key, as well as low intensity exercises such as push-ups, and resistance band training. Another tool to aid in the healing process is TENS Unit, which can help manage and relieve the pain, and you can even use it while doing the strengthening exercises! Strained Back - The number one injury while exercising is a strained back. According to the National Institute of Neurological Disorders and Stroke, 80 percent of adults will experience some form of back pain in their lives. A lot of common actions throughout the day can cause sore or weak back muscles, but a lot of injuries stem from constant sitting at work or going too hard and fast at the gym. Fortunately, most back injuries heal quickly, but some injuries are persistent and can even get worse. That’s where a TENS Unit can play a major role in managing and relieving the pain. TENS work by creating electrical impulses that travel along nerve fibers to create a tingling sensation over the pain area that reduces the perception of pain. Knee Pain - Although knee injuries are most common in athletes if you participate in any activities with jumping or rapid changing directions, knee pain can certainly flare up from just about anything, even just from your basic everyday grind and routine. Runner’s Knee makes up about 40% of all running injuries, and is caused by irritation of the cartilage under the kneecap. Rest, ice, compression, and elevation are vital factors to keep your knee protected after injury. A TENS Unit can help manage pain in the knees by being placed on the most common parts of the knee such as the side, back, and front, surrounding the knee cap. Not only can it reduce the amount of pain on the knee, but it can increase the range of motion and flexibility. Foot & Ankle Pain - Ankle injuries are one of the most common sports injuries. These injuries can happen to anyone at any age. Something as simple as walking on an uneven surface can cause a painful sprain. These injuries can compromise not only the connective tissue, but also the nerves, blood vessels, and muscles around the joint. For those looking for a drug-free and on-the-go pain relief, a TENS Unit can be placed on the foot or ankle to aid in circulation, reduce inflammation, and to speed up the rehabilitation process. Pulled or Torn Hamstring - Hamstring issues are usually caused by weak, overly tight, or imbalanced leg muscles. You are most likely to get a hamstring strain if you are participating in activities such as running and jumping, or sudden stopping and starting. Luckily, minor to moderate strains usually heal on their own with plenty of rest, ice, compression, and elevation. Stretching can also help prevent strains, as the muscles are then less likely to stretch beyond their limit during physical activity. 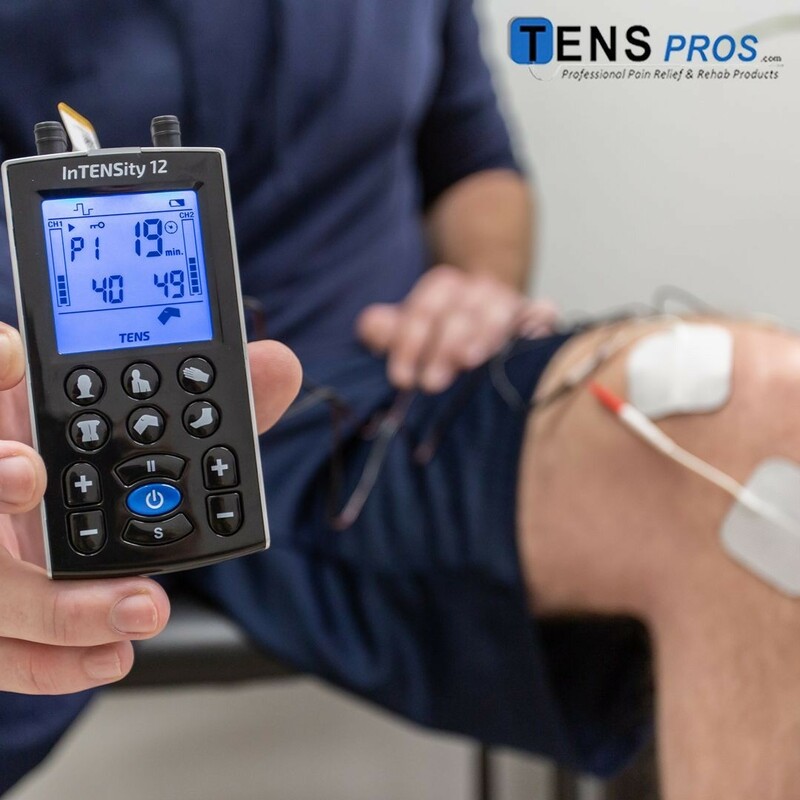 During this painful recovery period, a TENS Unit can be applied to the hamstring to reduce inflammation, relieve the pain, and strengthen the muscle. If you are suffering from an injury after your latest workout or sports event and looking for a drug-free option that is accessible and effective, make sure to click through our extensive list of TENS products to find the most suitable solution to fit your injury and get you back to the gym, on the field, or just back on track with your daily grind, in no time!